Cocina, daidokoro, keuken; whatever you call it, there's one room that every culture agrees is the heart of the home: the kitchen. There are many reasons we love our kitchens - including the fact that food can be found there - but did you know that they are also one of the easiest places in your home to go green and save your household some money while you're at it? If you've been looking to make your living space more energy-efficient and waste-conscious, the kitchen is a wonderful place to start - and you can see results almost immediately. 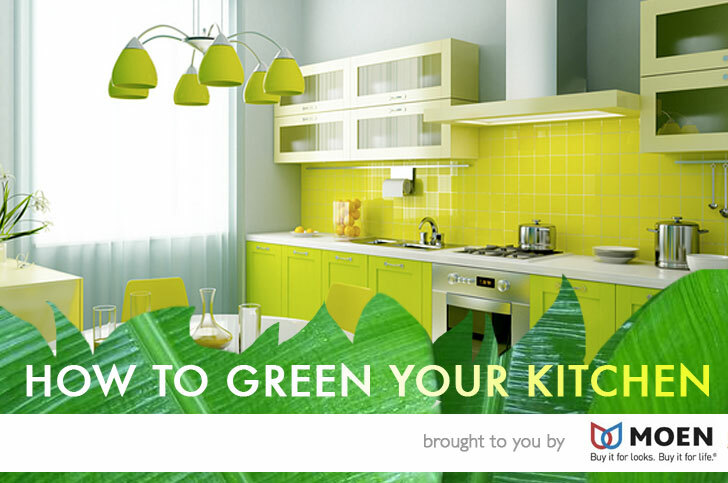 Read on for our 7 easy tips to greenovate your kitchen, and then use the cash you save to stock up on groceries! Plastic wrap and tin foil may seem like conveniences but they’re wasteful and, let’s admit it, kind of annoying to use. 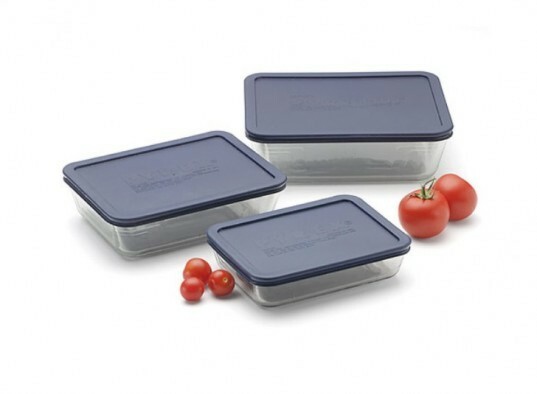 That’s why we recommend reusable glass containers like these microwave-safe Pyrex ones to store leftovers with zero waste and no hassle. Some ahead-of-the-curve families even serve dishes right out of these containers family-style so that at the end of the meal, you just pop the lid on and stick ’em in the fridge. When it’s time to reheat, just take the lid off and put it in the microwave. Plus, unlike a box of Saran wrap, they’ll last you a lifetime. As the #1 faucet brand in North America, Moen offers a diverse selection of thoughtfully designed kitchen and bath faucets,showerheads, accessories, bath safety products and kitchen sinks for residential and commercial applications – each delivering the best possible combination of meaningful innovation, useful features, and lasting value. One fun way to green your kitchen, is to grow a pet TickleMe Plant and watch how the leaves fold together when you Tickle It. The TickleMe Plant is real and easy to grow. I am going to make the Triage Box when I get home from work! I hate hate hate throwing food away and I think this will help. Love the triage box and foot pedals! Just heard how foot pedals for the sink are the best way to save water in a busy kitchen. Foot pedal faucets sound like an awesome idea!! Great tip! The triage system is so smart! Great ideas. 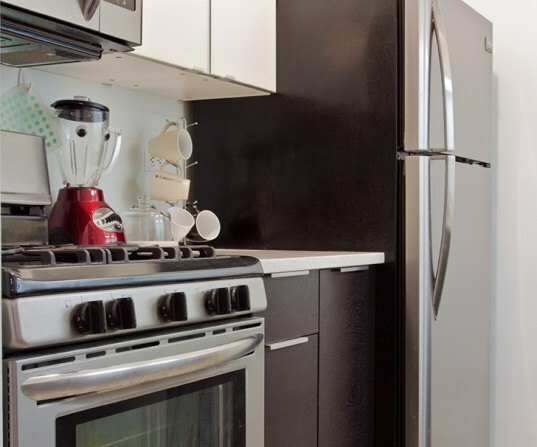 TIP 1: Pay attention to your appliances One of the reasons that it's so easy to make an impactful difference on the overall energy-efficiency of your kitchen is that some of your home's largest appliances are located there. Here are a few quick tips to ensure that you're getting the most out your kitchen appliances and utilizing them in the most energy-efficient manner: Dishwasher Despite what might seem like the logical conclusion, using a dishwasher (especially an Energy Star-rated one) has been shown to be more energy-efficient than handwashing - as long as you follow a few rules. First, make sure that you only run the dishwasher when it's full. If you've only got one plate or a few forks in there, it's most likely going to save more water to wash those by hand. Secondly, don't pre-rinse your dishes in the sink. This step was necessary in the past but most modern dishwashers are powerful enough that they can remove food residue without pre-rinsing, so skipping this step will save you a lot of water and energy (not to mention time!). Next, unless you for some reason desire very hot plates, use the air-dry setting instead of the heated setting to cut down on the electricity used in each run. Lastly, while we usually encourage repair over replacement, if your dishwasher is more than 10 years old, it's most likely best that you upgrade to an Energy Star-rated model. On average, Energy Star-rated dishwashers are 10% more energy efficient and 20% more water efficient than standard models and you can save about $40/year on electricity by upgrading. To see all of these tips in video form, check out this informative video from AOL. Refrigerator Even if you went out of the way to purchase an energy-efficient fridge, you might be sabotaging your decision by not using it properly. One common mistake is setting the temperature too low. You can check your owner's manual to determine the optimal temperature range (usually around 36°-38°F), but if you notice that some of your food is super cold or even frozen, you should turn your temp down a bit or reserve those "cold zones" for more spoilage-prone foods. Remember that for every degree below 38°F, your unit consumes 5% more energy; so if you have it set to 36°F now and it's too cold, consider raising it a few degrees. Another easy tip is to use glass tupperware. Glass is not only more long-lasting than plastic or foil, but it also provides a better insulating barrier that keeps food and beverages colder. Lastly, make sure that you clean your refrigerator coils (located behind and sometimes underneath it) every year or so by unplugging the unit, moving it away from the wall and simply vacuuming them. The dustier and dirtier your coils, the less efficient your fridge's fan will be, so help it out by keeping the coils clean. TIP 2: Install sensor faucets or foot pedals In our last tip, we mentioned that using a dishwasher has actually been found to be more water efficient than hand washing, but that's really only true if you're washing a full load of dishes. If you live alone or just don't have that many dishes to wash, hand washing is probably the way to go. A smart way to control the amount of water you're using is to install sensor faucets or foot pedal-activated faucets. If you think about how much water we waste when just washing one dish because there's no way to turn the water off with our hands full, it's easy to see how handy it would be to be able to control the water flow with our feet or a tap of the wrist. Motion-activated and foot faucets also give you the added bonus of not having to touch a sink handle with your hand, which is perfect for people who have kids, pets or other walking germ factories in their households. TIP 3: Set up a composting system Saving water and energy is high on the list but when you consider how much food we waste as Americans - the tally was 33 million tons in 2010 - much of the greening we can do in the kitchen has to do with conserving or repurposing our food scraps. One of the best ways you can transform your edible waste into valuable soil is by composting it. Composting does take some time and patience but there are many products out there to simplify the process. 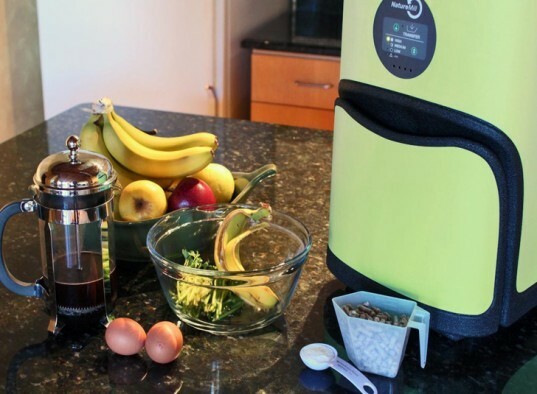 If you're planning to compost indoors, try an odor-minimizing, compact composter like the Naturemill. For those who have the luxury of a backyard or outdoor space, there are many online resources such as howtocompost.org to get you started on a larger compost pile. Once you have the hang of it, you may even be able to use the resulting nutrient-rich soil to grow your own food, which will help make your kitchen and cooking even greener. 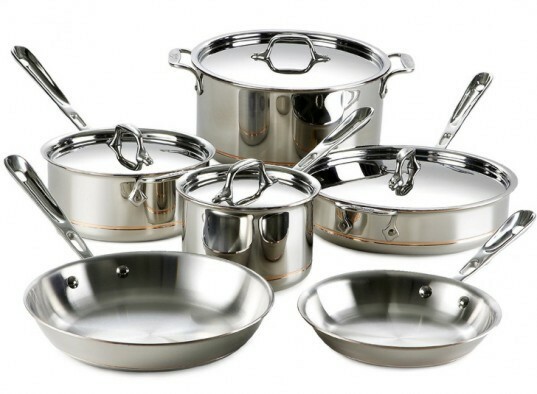 TIP 4: Make sure your cookware is safe & eco-friendly We might know Teflon as a modern convenience but considering it's been linked to both high cholesterol and cancer, we'd say it's best to steer clear and go for safer non-stick cookware options like all-clad aluminum. Many professional chefs are also known to favor old-fashioned cast iron cookware for the wonderful sear and flavor it imparts and it has even been thought to be better for our health because it may impart iron into our diets. STEP 5 - Make a fridge triage box If you've ever brought home a new carton of eggs only to realize that you already had a half-full one hidden away at the back of your fridge, you probably had a "d'oh!" moment that could easily have been avoided. 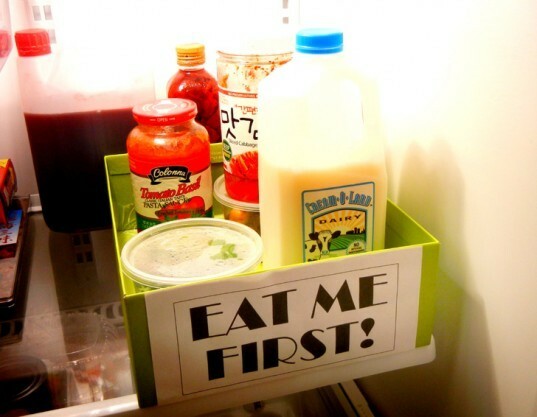 Americans waste a ton of food (33 million tons of food in 2010), and a lot of that trashed food could be saved if we added one simple, practically free thing to our refrigerators - an "Eat Me First" or fridge triage box. While it may look ridiculously elementary - yes, it's just a box with a sign on it - this device acts as a surprisingly effective visual cue that changes the way you and your family view the food in your fridge. Just place all of your more easily perishable or close to expiring eats in the box and teach the other members of your household to check out the items in the triage box first when they open the fridge. If you've ever purchased a $7 block of cheese only to have the whole thing go bad because it was hidden away behind a box of milk, you can see how this handy box can save you a ton of money and keep good food from heading to the landfill. 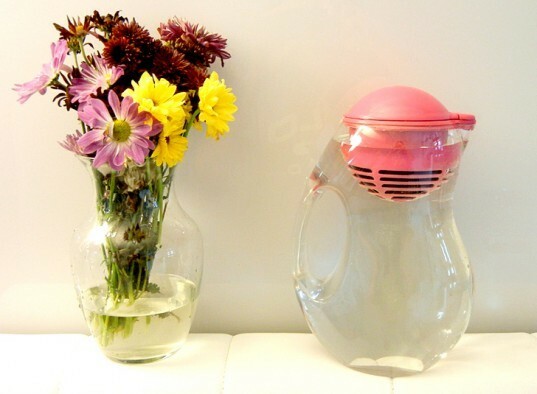 TIP 6: Keep a water-purifying pitcher in your fridge Ditch the bottled water habit and invest in a Brita pitcher or Bobble water jug for your kitchen. Drinking water from the sink (if the tap water in your area is safe) is fine too but keeping a pitcher in your fridge during the summer months is a smart way to avoid having to keep the faucet on to let the water run cold. You can get fancy by dropping some lemon or lime wedges in the bottom portion of your pitcher to make your water taste even better but just remember to clean it and your filter every week or so. TIP 7: Invest in quality glass or aluminum food storage containers Plastic wrap and tin foil may seem like conveniences but they're wasteful and, let's admit it, kind of annoying to use. That's why we recommend reusable glass containers like these microwave-safe Pyrex ones to store leftovers with zero waste and no hassle. Some ahead-of-the-curve families even serve dishes right out of these containers family-style so that at the end of the meal, you just pop the lid on and stick 'em in the fridge. When it's time to reheat, just take the lid off and put it in the microwave. Plus, unlike a box of Saran wrap, they'll last you a lifetime.